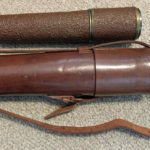 British Scout Regiment Telescope Mark II S. These were issued to sniper teams and were usually carried by the Observer. Most had a leather covering. This one has a later type of water resistant covering. Open position. 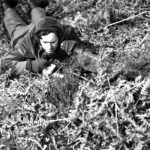 British Commonwealth snipers usually operated in teams of two, a sniper and an observer. Binoculars were handy for general scanning of an area and a rifle scope could deliver bullets effectively once a target was “acquired”. 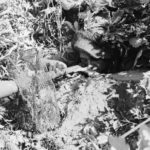 This combination could work well when the enemy was exposed, but finding a well camouflaged enemy sniper was another matter. The British found that the 20 Power (20X) three-draw (?) Telescope, Scout Regiment, Mark IIs was quite good for this purpose. This scope is of the traditional style used by the British Royal Navy and the Army and indeed, Horatio Nelson’s officers likely used very similar models in the late 1700s and early 1800s. 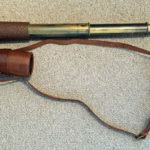 British Scout Regiment Telescope Mark II S. These were issued to sniper teams and were usually carried by the Observer. Most had a leather covering. This one has a later type of water resistant covering. Closed position. 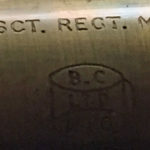 British Scout Regiment Telescope Mark II S. Detail of markings (lower portion) . 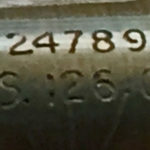 Serial number 24789. Optical Stores number 126 G.A. Telescope with built in sun shade and a shutter to protect the eyepiece from dirt. Leather carrying case with built in leather sling. There was NO stand, so an observer had to rest it on a branch, dirt, wall or even part of his body. I do not know how many were made. Serial numbers go into the thousands. 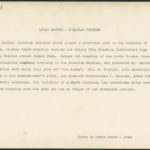 For example the author has owned serial numbers 3938, 6640, 13566 and 24789. Most examples seen are not dated. The lower serial numbers, under 5,000 for example, may be presumed to be WWII period. These scopes continued on issue into the 1990s and I do not know when they ceased to be manufactured or ceased to be issued. The scopes are numbered on the first draw, just in front of the eyepiece. Users were instructed to open the case, slide the scope out a little bit and then extend the sun shade. Then the rest of the scope could be withdrawn safely. The user extended the scope to its full length. Soldiers were instructed to focus the scope and then inscribe a line on the tube so that they could quickly find that position again. The eye piece shutter was opened by using a fingernail to engage the little stud and move the shutter to the side. Some other telescopes were used by observers. 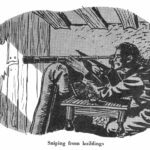 There were naval telescopes of course and army signallers has used telescopes for many years, for example when reading visual signals sent by semaphore or mirrors. 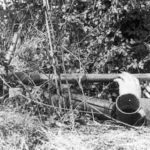 This may be because of availability, of because of familiarity, or possibly a Lovat Scout might have a favorite scope that he had used for years. This photo shows some Lovat Scouts training in Alberta, Canada on winter mountain warfare training. The observer on the left has a telescope that is not a Scout Regiment one as is has two end caps. 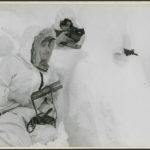 The Canadians developed a new “Telescope Observing Sniper’s C MK. I“ of 25 power in the latter part of the war. Return to my Sniper Rifles & Snipers page. Return to Sniping Observation Telescopes page.